Kansas City, MO – Reveling in an injunction issued by U.S. District Judge Howard Sachs earlier this year that blocked enforcement Missouri’s long-standing requirement that those who conduct abortions must have hospital privileges within 30 miles of their abortion facility, two Planned Parenthood organizations are pushing forward with plans to expand abortions into four communities in the Show Me State. However, Planned Parenthood’s abortion expansion plans may be short-lived. On September 12, 2017, the Eighth Circuit Court of Appeals granted State Attorney General Josh Hawley’s request that the full court rehear the appeal of the ruling that blocked the long-standing safety regulations. The Eighth Circuit also ruled to vacate a July ruling that denied the state the opportunity to make a motion in opposition to the restraining order that Planned Parenthood is relying on to expand their abortion businesses. 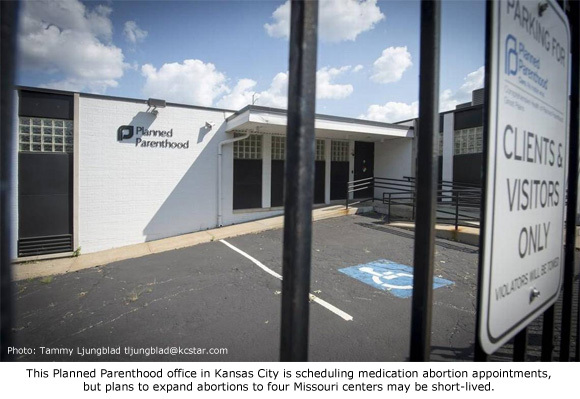 Earlier this week, Planned Parenthood Great Plains, based in Overland Park, Kansas, announced that it has begun taking appointments for medication abortions, which are expected to resume next week. It also reportedly just passed a state inspection of its Columbia location, which has been the heated fulcrum of Missouri’s abortion battle for a number of years. Planned Parenthood of Greater St. Louis Region has signaled that medication abortions at its Springfield center are just weeks away. It also plans to add abortions to their list of services in Joplin. None of the abortionists involved in the expansion plans have qualified for hospital privileges, leaving women at risk of delay in emergency care should abortion complications arise, as they have all too frequently at the currently-lone Missouri abortion facility in St. Louis. This means if the state appeal to the full Eighth Circuit is successful, the four expansion locations would again be in non-compliance of Missouri licensing requirements. •	Informed consent must be given by the person conducting the abortions. SB5 also has placed the authority of enforcement of this new law within the jurisdiction of the Attorney General’s office, and provides new protections for whistleblowers who come forward with information of violations. “Planned Parenthood organizations in Missouri have been known to engage in dangerous and deceptive practices in order to circumvent state laws and safety regulations. Given their poor past performance, I believe Planned Parenthood’s anticipated abortion expansion will not last long,” said Troy Newman, President of Operation Rescue. The work of Operation Rescue in documenting abortion abuses at Planned Parenthood’s St. Louis abortion location provided a basis for many of the provisions in SB5. A 2015 State Senate investigation, led by State Sen. Kurt Schaefer, into Planned Parenthood’s shady operations led to the discovery that Planned Parenthood Great Plains had obtained phony hospital privileges for their Columbia abortionist Colleen McNichols, along with irregularities in in the required pathology reports for all tissue and human remains from abortions. It also revealed that the Department of Health at that time may have been complicit in allowing these violations. Since then, a new pro-life administration under the able leadership of Gov. Eric Greitens made no bones about their efforts to ensure abortion facilities stop their shoddy practices. Also, the Missouri Department of Health has appointed a new director who is dedicated to ensuring that the laws of that state are properly enforced. Despite the headlines touting Planned Parenthood’s abortion expansion, Newman remains hopeful. “We will just have to wait and see how the legal issues and the new law pans out in Missouri, but given the new conditions in Missouri with a new pro-life administration and the new law, don’t place any bets on Planned Parenthood,” he said.